There is something particularly satisfying about using a flagship pen. You realize you are holding on to something that helped define a brand: the pinnacle of what makes that brand what it is. I have tried a few of these flagship pens in my day: the Montblanc 149, the Sailor King of Pen, and, of course, the Pelikan M1000. 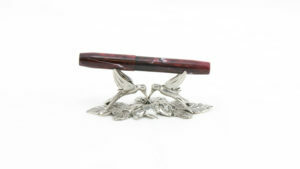 The largest of the Pelikan Souveran line, the M1000 is the status pen for Pelikan, with the size (and price tag) to match. It comes in black or green stripe acrylic/resin as part of the regular production line. Special, limited editions have been made available through the years as well, including demonstrators and maki-e or raden finishes. 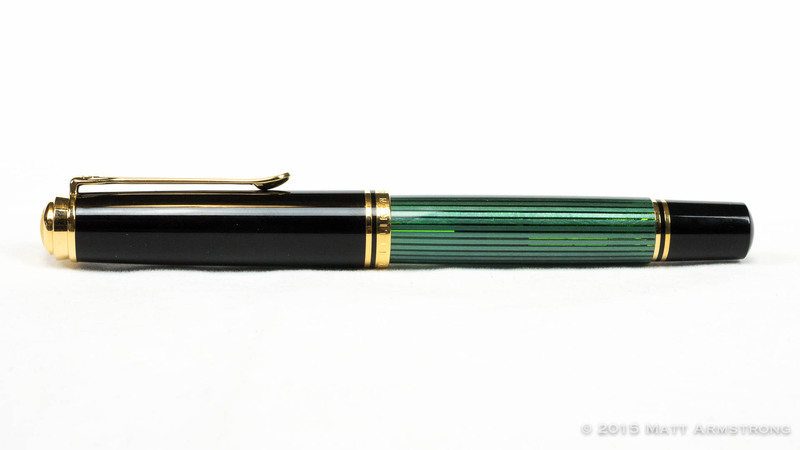 The barrel of my pen is the classic green stripe acrylic for which Pelikan is known. The green stripes are opaque, but the space between them is translucent, allowing you to see ink levels (so long as you’ve got a decent backlight.) The barrel, too, is perfectly cylindrical and comes to a termination at the piston filler knob. 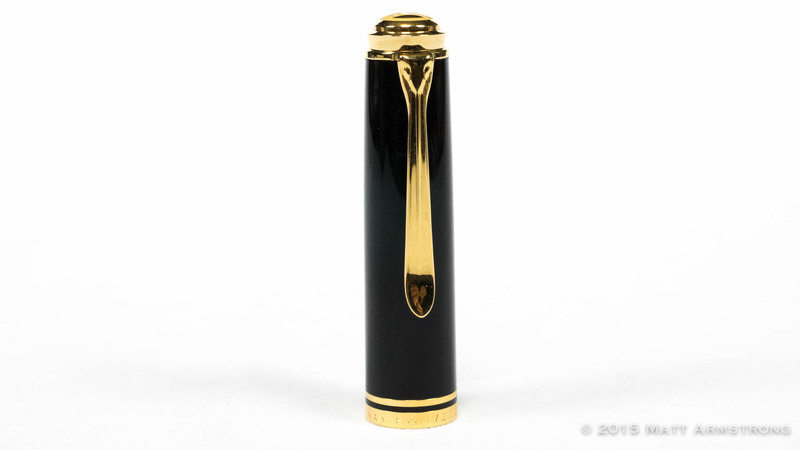 The knob itself is made of the same black resin as the cap and also features a double band in gold. It then comes to a nice, domed terminus. 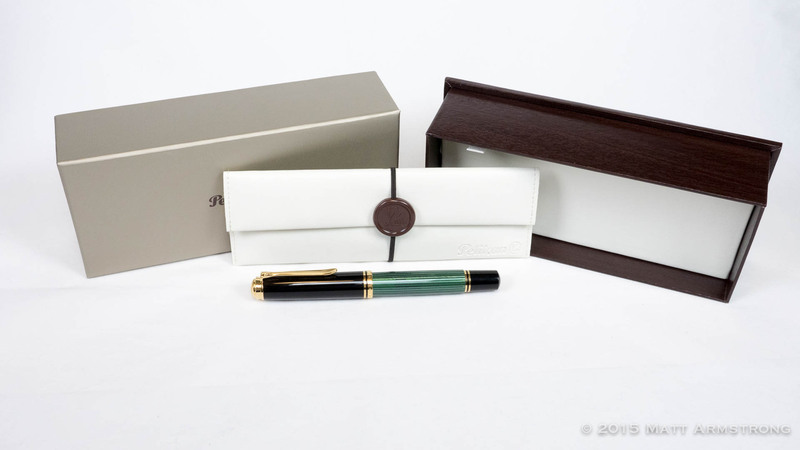 Looks-wise, Pelikan pens walk that fine line between understated and ostentation. They are clearly showpiece pens, but most of them—the production line especially—aren’t very showy or flashy. They would be the weapon of choice for the conservative businessman or businesswoman who wanted to communicate status without having to resort to the same old boring black cigar-shaped pen everyone else has. Under the M1000’s cap, which comes off the barrel in ¾ of a turn, is a smallish, black section. I normally struggle with Pelikan’s sections a bit due to their lilpution height in comparison to the rest of the pen. (Seriously, Just move the threads back ½” and you’d solve the problem! I checked the inside of the cap. There’s space!) On the M1000, the height of the section is less of an issue than on the smaller-sized pens because of the pen’s overall larger proportions and longer nib. The section is girthy, befitting a pen for large hands, but does have a slightly tapered profile to improve the ergonomics of the grip. Pelikan’s nib design is one of the most beautiful in the business, and it is shown off to full effect on the M1000. 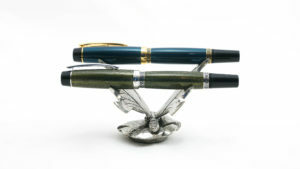 Pelikan uses a rather unusual (and unique to them) nib profile: long and slender, with narrower shoulders and a shallower curvature. 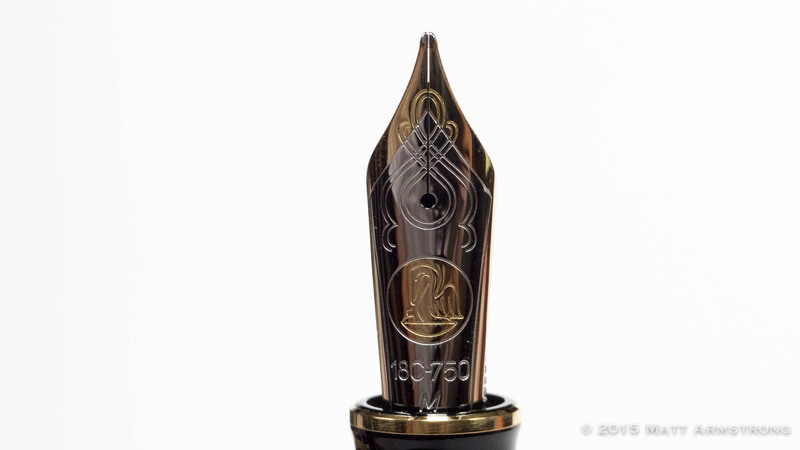 The face of the bi-color 18k nib is stamped with a series of intersecting, graceful, swooping curves. The Pelikan logo is stamped in the middle of the nib face along with “18C-570” and the nib gauge designation—medium in my case. Unlike the relatively rigid nib on the smaller M400, M600, or M800 pens, the M1000 nib is bouncy nearly to the point of being soft. It has a really lovely give that shines on cursive writing and shows off the best qualities of shading or sheening inks. This is not a flex nib at all, and being 18k, shouldn’t be “pushed” to achieve line variation. 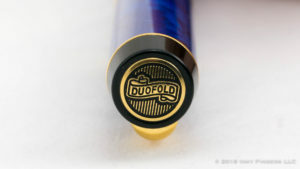 But you will see a natural softness unlike any other flagship pen from the major manufacturers except, perhaps, the Dreamtouch nib from Visconti, which has a similar, albeit somewhat springier, feel to the nib on the M1000. The nib had other issues as well. For starters, the tines were wide enough you could push a wheelbarrow through the nib slit, resulting in a torrential ink flow. The too-spread tines combined with being over-polished, resulting in the good old fashioned baby’s bottom that skipping and hard starts. I had to, after inking the pen the first time, close up the tines to slow down the ink flow. This helped a bit, and now the nib only writes like a western broad. It is still very wet and smooth, but continues to exhibit lesser examples of the baby’s bottom problems. Eventually, I took the nib to a nibmeister to have it adjusted and ground into a cursive italic. 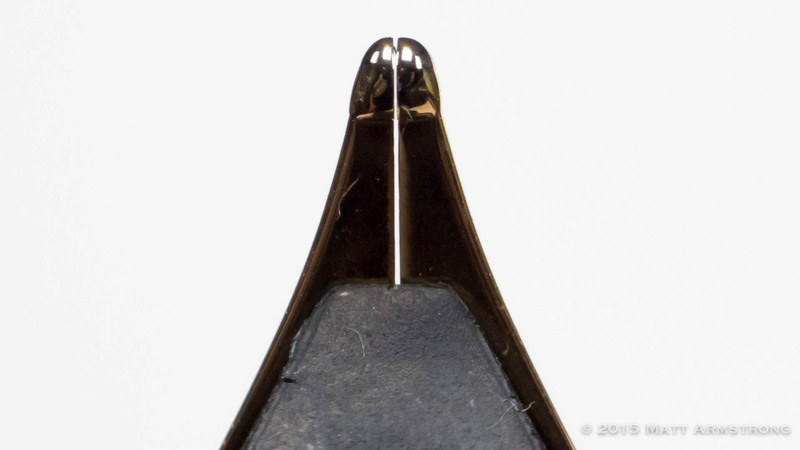 I find it rather unfortunate that the nib in a pen this expensive came with so many problems. Unfortunate, but not surprising. My experience over the last few years is that Pelikan QC has become really shaky. Sometimes I get a really great writer. Sometimes it’s nearly unusable. Consistency and quality no longer appear to be the buzzwords they once were. As a result, it’s hard to assign an identity to the way a Pelikan writes, because what you get may vary a fair bit from pen to pen. 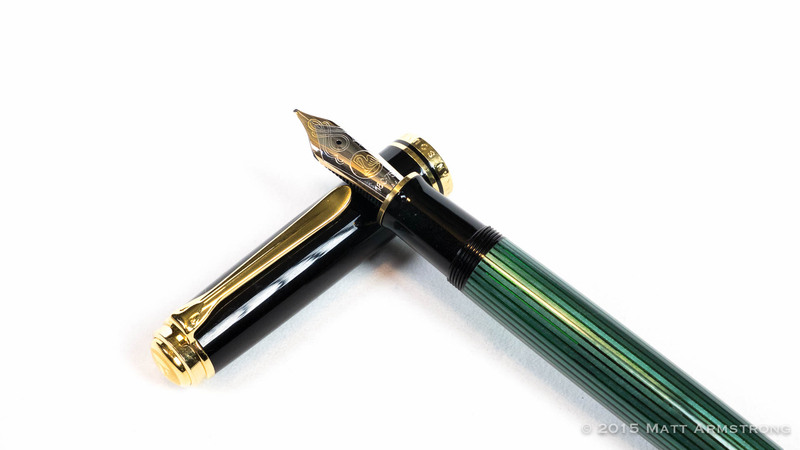 The Pelikan M1000 is a very expensive pen, befitting its status as a flagship. 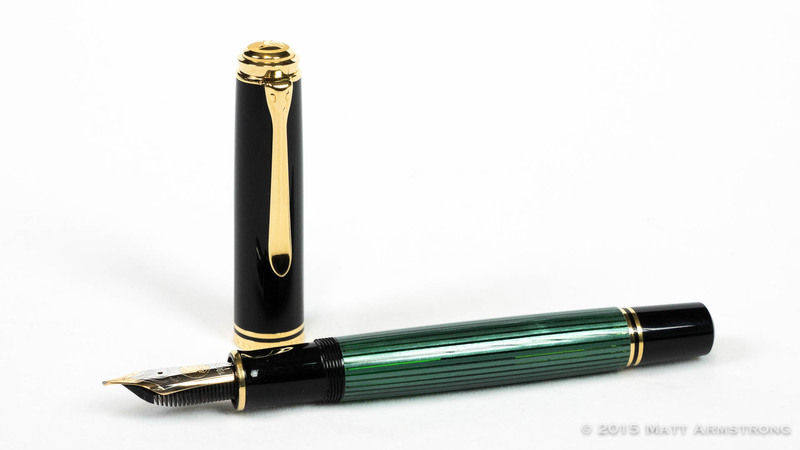 Pelikan recently increased its prices significantly, and in the US, this pen commands a staggering MSRP of over $1,000. 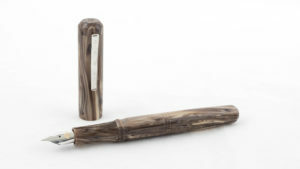 It’s a solidly-built pen body, with one of the best piston-fillers in the industry. It’s classic and refined-looking, with more personality than a Montblanc 149. But for a pen in this price range, a pen that should be shouldering the very reputation of the brand, the nib issues I experienced on this M1000 were inexcusable. I hope that Pelikan uses the money from these recent price increases to invest more heavily in quality control in their nib department. Until then, my advice is to go ahead and get a Pelikan. They’re a great pen. Just buy them from a place with a good return policy or a retailer that will check/adjust the pen before sending it out.